Your braking system is one of the most important safety features your vehicle has to offer. Trucks, cars and SUVs all rely on their brakes to help you avoid daily road hazards and obey traffic laws such as coming to a full and complete stop whenever necessary. It's only because your brakes do not need to be changed as often as your oil that we tend not to think about them before it's too late. Your brakes are meant to wear down as they are used, there are ways to extend the life of your brakes by coming to slow and gradual stops whenever possible. If you haven't had your brakes checked in a while it might be time to have them inspected. We can check your brakes while performing other maintenance or repair services, so let us know if you think you can benefit from a brake check and we'll be happy to take a look. Your brake pads serve a very important function. Much like the oil in your engine, your brake pads help prevent metal-to-metal contact whenever you engage your braking system by depressing your brake pedal. WIthout your brakes, your braking system would cause a lot of friction and in turn, heat which can warp your braking system and cause it prematurely fail, putting yourself and others on the road at risk. But not to worry, your brakes will tell you when it's time for them to be changed. You will hear a squeal or screech when you depress your brake pedal telling you that it is time to have your brake pads inspected. This is because most brake pads come with a metal filament in them and the squealing of your brakes is meant to serve as an early warning system. 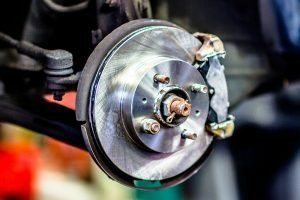 If you neglect your brakes then your braking system will make metal to metal contact with can result in more involved and expensive brake repairs. So if you have questions about your brakes, do not hesitate to give us a call, drive on into our shop or conveniently schedule an appointment online for a day and time that works for you! We'll be happy to help with all your automotive needs and get you back on the road in a vehicle that is both safe and reliable.